Abrar Hussain: President Abdul Hamid congratulated Tayyip Erdogan on his re-election as President of Turkey yesterday, stating that this is a ‘demonstration of Turkish people’s confidence’ in his leadership. “I’m immensely delighted to know that the people of Turkey have re-elected you as their President for a new term. I would like to extend my warmest felicitations to you on this grand electoral success,” said President Hamid in a message. 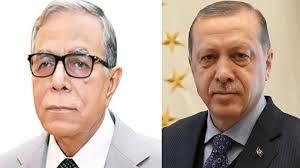 President Hamid also extended an invitation to Erdogan to visit Bangladesh at a mutually convenient date as soon as possible, according to the Foreign Ministry here, reports UNB. “Both of our countries have excellent bilateral relations based on commonalities rooted in history, culture, faith and tradition,” he said. President Hamid added that the brotherly people of the two countries would continue their march towards peace, development and prosperity in the coming years.